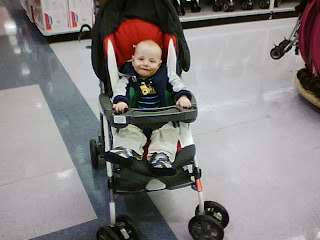 After our stroller was ruined on our flight home from FL, Ben and I went stroller shopping today. 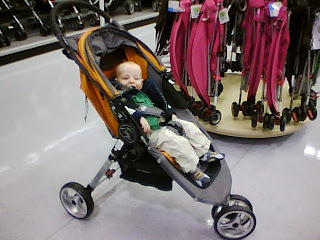 Much more fun this time with a child to TRY in each stroller....as opposed to shopping over a year ago imagining a baby! 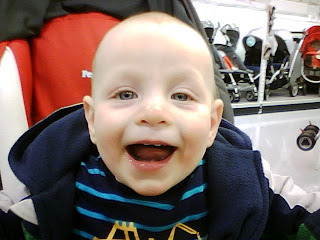 :) Benny had fun too! If you bought the "jogger" model, that will be good for Nick to get exercise. I haven't ordered one yet. I'm struggling with the decision! 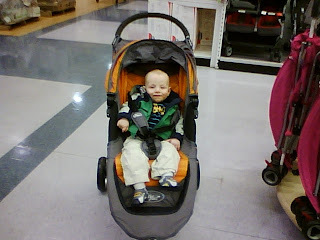 Fortunately, I found out today the airline is giving us ALL the money back for our damaged one! :) Less than a month until we are down there! We are excited to see you guys, too! Hooray! That's great news that the airline is refunding allllll the money back to you! They can be a pain to deal with.